A response to the Mayor of Newham following a briefing sent to all Councillors and Newham MPs. Thank you for your weekly briefing. I must admit that I am surprised and concerned that you are involving yourself in a scrutiny matter into your own Executive. I would have thought that if Cllr McAlmont wished to contact Councillors about Scrutiny he would have done so himself directly. However, there are a number of inaccuracies in the statement in the Weekly Briefing (see below) to which I must respond. To be clear. No Councillor members of the Fire Safety Scrutiny Commission have said at any meeting that they supported it being held in secret. Officers have confirmed that there is nothing stopping the Commission from being held in public. I had indeed said at the first meeting of the Commission it had been “positive and constructive” but I also said immediately afterwards that there had been nothing said whatsoever at that meeting that justified it being kept secret. It is a complete abuse of the English language to suggest that a meeting which stops the public, Newham housing residents or media from attending is not a “secret meeting”. Of course it is - and it is frankly a little silly to suggest otherwise. If there is any very confidential personal or procurement matter that needs to be held in camera then there is well established Council procedures and guidance on closing that part of the meeting for that matter only. The Grenfell Tower Fire was a disaster and will change the face of social housing. We are not yet certain what caused the fire and that is one of the reasons for holding the scrutiny. Yet is already clear that residents in Grenfell Tower were not listened to and that there was excessive secrecy which is thought to have contributed to the disaster. I urge Councillor McAlmont to change his mind and let the meeting be open to the public and also invite residents who live in the 3 blocks with ACM cladding to send representatives to sit on the scrutiny as well. It is residents who should be key in protecting themselves and their families. I hope you and the Chief Executive will instruct Executive members and Council Officers to attend the scrutiny. In the meanwhile I have been asked by residents to continue with the scrutiny process so I intend to raise written questions to Housing Officers and Cllr Paul, the Police and the Fire brigade. I have also asked an experienced technical officer to accompany me on site visits with local Councillors and inspect the Tower Blocks and report back in public. I am still awaiting a reply about the fate of the Housing Residents scrutiny commission which has now not met for over a year". Since the tragic Grenfell Tower disaster in June, Newham Council has been working hard to ensure our tower blocks are as safe as possible. Work is currently underway to remove the aluminium composite material (ACM) cladding from three tower blocks in the borough – Ferrier Point, Nicholls Point and Tanner Point. This is a substantial piece of work and the council has ensured that all council members and affected residents have been kept up to date with any developments relating to this. The Fire Safety in Tower Blocks Scrutiny Commission will look at this work, gather evidence from key figures including the London Fire Brigade and submit its findings with any recommendations by 31 December 2017. The Task and Finish Commission have clear terms of reference to undertake scrutiny enquiries which lead to recommendations to improve service delivery or assist in policy development. The following statement this week was issued to the Newham Recorder on behalf of Councillor Anthony McAlmont, Chair of the Overview and Scrutiny Committee in response to Councillor John Gray’s resignation from the Fire Safety in Tower Blocks Scrutiny Commission. Councillor McAlmont said: “I am disappointed that Councillor John Gray has resigned from the Fire Safety Scrutiny Committee. Both myself and Councillor Terence Paul, lead member for housing invited him to retract his resignation as he has previously described the meetings as ‘positive and constructive’. 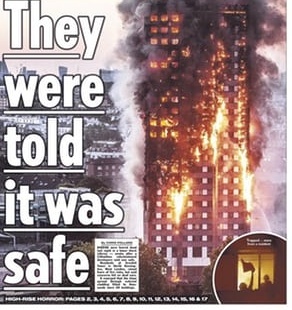 “The Fire Safety in Tower Blocks Scrutiny Commission is not a secret meeting. It is a Task and Finish group which meets informally to enable information to be gathered and to enable those presenting evidence to be more open in what they say to the commission. It also enables specific items of work to be completed quickly. A report will be produced once the commission is complete and this will be brought to the Overview and Scrutiny Committee meeting in January which is held in public and will be attended by Councillor Paul. Copies of the report will also be made available publicly online. This process was agreed at Full Council in July by all members in attendance which included Councillor Gray. Please find attached the latest edition of the weekly Members briefing. If you have any comments or queries please contact me.